MORE THAN CARPENTRY Christian Ministries – Building. Shaping. Restoring. It’s Time for Camp Penuel 2018! More Than Carpentry Christian Ministries, 1259 Stephen Jones Avenue, St. Louis, MO 63133. Spaces are provided on first-come, first-served bases! You can learn more about Camp Penuel at this link. Watch a YouTube video from our team last year here. Check out the Camp Penuel Facebook Page here. We make every effort to keep the kids safe while they are having fun. 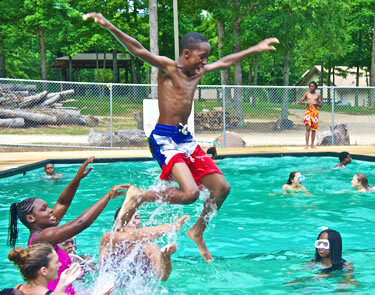 Each cabin has two adult counselors that are background checked and stay with the kids throughout all the activities. The kids sleep in air-conditioned cabins in bunks. During the day they enjoy swimming in the pool, where certified lifeguards stand watch at all times. The boys and girls are kept separate at all activities except for meals. The kids love the water slide, nature hike, canoeing (with mandatory life vests, of course!) and crafts. They attend chapel each morning and evening where they sing songs, dance and hear the gospel of Jesus Christ. They learn that they are dearly loved by God and each of the counselors who volunteer to spend the weekend with them. Please consider allowing your children to enjoy a weekend away with us! We would be delighted to have them! If you have any questions, don’t hesitate to call Tammy at (314)862-0515. More Than Carpentry Christian Ministries is a 501(c)3 charitable organization founded in 2005. We are grateful to the many generous supporters who make this ministry possible. We hope you will consider joining us!